Over 50 common and exotic scales and modes for bass. 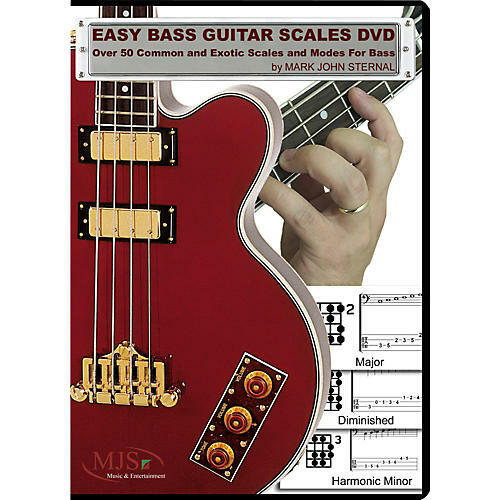 The Easy Bass Guitar Scales DVD has every bass scale you've ever wanted to learn. Presented in a simple root to octave format, it starts with basic scales such as major, minor, pentatonic and blues. Next learn to play the patterns that span all musical styles and cultures with exotic scales like the Balinese, Hirojoshi and Kumoi. This invaluable resource contains over 50 scales you can use to spice up your bass playing. Each scale is presented with a video demonstration at a slow and fast tempo in the top half of the screen. The bottom half of the screen lets you choose how the music is displayed: note charts, traditional notation, or bass tablature.